Ever wonder what makes a bike roll, turn, and stop? 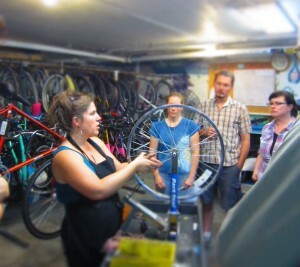 Over 5 sessions, learn how to properly disassemble, clean and completely rebuild a bicycle. In pairs, students take apart and rebuild a BICAS project bicycle. 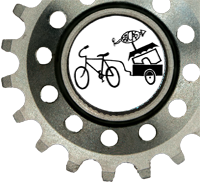 Learn to rebuild bearing systems, replace cables and housing for brakes and shifters, install chains and properly adjust derailleurs. Upon completion of this fun course, each student receives a $45 BICAS credit to spend on shop time to fix up their own bicycle. Get ready for that great Tucson riding weather! 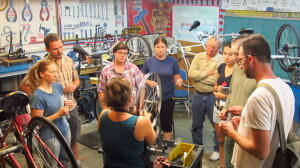 Whether you rely on your bike to get you to school and work, or just love riding the Loop trail in the cool mornings, this class will teach you the skills for overhauling a bicycle to get it running faster and smoother. This is a beginner – intermediate class. Recommended age for the class is 16 and up. Click class for link to the online registration page. Class Dates: May 7th, May 9th, May 14th, May 16th & May 21st. If you are unable to attend a class, please let us know at least 48 hours before the class is scheduled to take place and we will give you a full refund or a credit for a future class. If you don’t let us know 48 hours in advance of the class, you are not entitled to any refund or credit.